Despite being heavily pregnant and having a toddler to run around after, I always try to make time to paint my nails. I love switching up colours and styles, it always make me feel a little bit more me. With summer in full swing I have been swaying towards the brighter summery colours as I do every year, and every year I'm naughty and add more to my collection - despite my hubby's disapproval! As always, OPI bring out some fab collections through each season every year. I love getting these as they are the mini sizes and allow you to experiment with the latest trends, never failing on quality plus they don't break the bank. I was recently sent from Just My Look (who currently have up to 40% off OPI!) 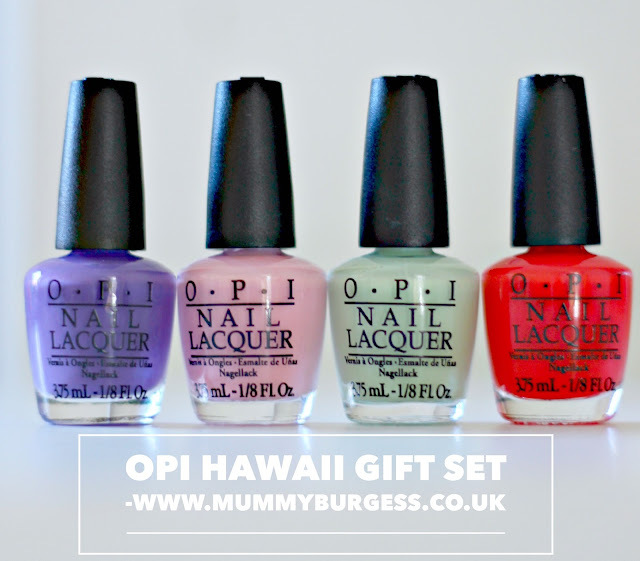 the Hawaii gift set which is perfect for this time of year. The set includes four shades, I Lost my Bikini in Molokini, Suzi Shops and Island Hops, That's Hula-Rious, Aloha from OPI. I was instantly drawn to Aloha from OPI and That's Hula-Rious, both are such gorgeous colours and so very me! The mint colour is literally the perfect shade, I have been searching for the perfect mint colour and it's definitely this. The quality, as expected, never fails. You need about three coats to get a true opaque finish but it dries relatively fast, which did surprise me. Staying power, about 3-4 days with no chips, not the best but I switch them up so often that doesn't bother me. Plus I didn't put a top coat on so probably would last longer. *I was kindly sent these products for the purpose of the review. All thoughts, opinions & images are my own.